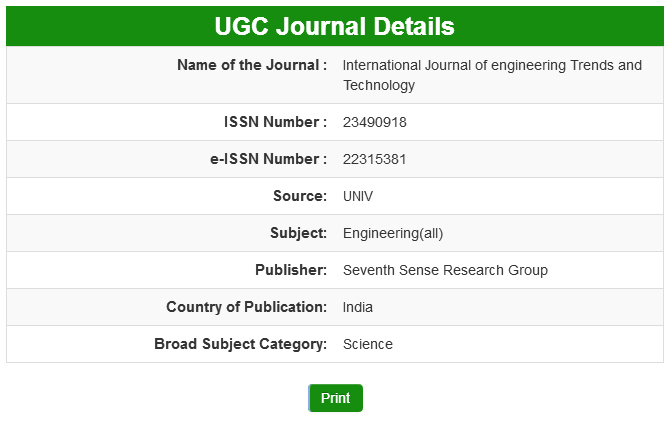 International Journal of Engineering Trends and Technology - IJETT is a peer-reviewed, open access journal which publishes a wide range of original research and review articles. The journal editorial board welcomes manuscripts in both fundamental and applied research areas and encourages submissions which contribute novel and innovative insights to the field of engineering sciences. All submitted articles considered suitable for IJETT are subjected to rigorous peer review to ensure the highest levels of quality. Original papers which provide an important contribution to the development of engineering sciences and report on significant developments in the field are encouraged. The review process is carried out as quickly as possible to minimize any delays in the online publication of articles. IJETT aims to advance the understanding of engineering sciences by providing a platform for the publication of unique contributions in the field of engineering across a variety of topics, including, but not limited to the topics listed in our website. IJETT is the flagship publication of Seventh Sense Research Group ( SSRG )®.